Information products are in digital format and can be downloaded to peoples' computers so there is no shipping and handling involved. These are electronic products. You can create cd’s and dvd’s also and these will require handling and shipping. But they are very popular also. One electronic product (ebook or report) can be sold over and over again an unlimited number of times. It is a completely renewable resource. It costs you nothing to create and can bring you an unlimited number of dollars. It all depends on how dedicated you are to marketing and selling it. Let's say you have written a couple of short articles -- 500 to 700 words. This is usually 1 to1-1/2 pages on your word processor. You have made short paragraphs -- 1 to 4 sentences. Notice that is what I am doing here. It is much easier for people to read and digest short paragraphs rather than lengthy rambling ones. The articles you have written must NOT be sales pitches. They must be informational. They must tell people about the product in terms of what it will do for them. You may ask, “Why all those ‘musts’?” Because people are offended if they buy a product and it turns out to be a sales pitch. Their impression of you will immediately be one of disgust. You promised them good and valuable information and they have the right to be angry. However, if you do deliver them good, solid information they will hold you in esteem. You can and should give them some reference to a few valuable resources that will truly benefit them. But those should be in keeping with the theme of the product they have purchased. It should also be presented in context with the portion of your article or book where it has direct relationship to the particular information being expressed. For example, suppose there is a chapter in the book about driving traffic to your product. You may place an offer in that discussion for a search engine submitter or some other traffic-generating product. But, It should never be an in-your-face proposition. Here is another example. This report is about PLR. 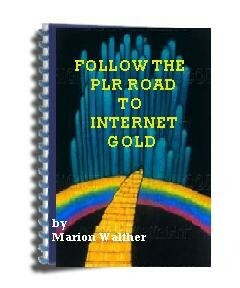 I sell PLR among many other products. So I have a sales page at one of my websites where I offer PLR for sale. When I write articles about PLR, I will include a link to that sales page at the end of the article and invite the reader to click on it so he/she can view my particular product.